The patina look is alive and kicking. There’s something about the Gulf livery that makes us swoon and people pay big bucks for the chance of owning a car with the fabled blue and orange coloring. Aston Martin recently revealed a limited edition GT12 inspired by Gulf Oil colors priced somewhere north of $300,000 and that now commands closer to $600,000. But we’ve also seen car styling experts apply their skills in creating Gulf livery projects for a range of motors. And this latest example might just be the best of them all. Based on the magnificent machine that is the Porsche 911 GT3 RS, Dutch outfit Neidfaktor has given the range-topping 911 a totally unique look, combining the famous baby blue and orange colors of the Gulf livery with a patina style rust and corrosion effect we've previously seen done on a similar car with a Martini livery. The majority of $100,000 sports car owners want their rides looking pristine. The owner of this 911 GT3 RS obviously had other ideas. What motivates someone to spend money on making their ride look like it’s been rotting away in a garage, or has just come back from a world tour through some extreme climates? We’re not too sure, but you have to appreciate the work done by the wrapping experts. Even up close, the car looks like it’s had a rough time while in all actuality, there’s a perfectly good looking body underneath. Obviously once the owner gets tired of the look, he can simply remove the wrap and forget it ever happened. But we think there's plenty of life left in this beaten up Porsche 911 GT3 RS. 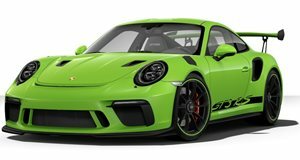 Porsche’s latest track attack weapon is fast and user friendly.